Use AiRx Allergy 20x20x1 furnace filters to turn your air conditioning and heating system into a whole house air cleaner, dramatically reducing mold, pet dander, smoke particles, dust, pollen and dust mite debris throughout your home. Using a MERV 11 HVAC filter media, these 20" x 20" x 1" air filters act like a micro-particle magnet. AiRx Allergy AC filters trap and lock allergy related particles, protecting your entire home. Make your home a healthier haven and shelter your loved ones from air contaminants. AiRx Allergy filters not only protect you from allergens, dust and debris, they also protect your heating and air conditioning equipment from clogging with dust, affording optimal operating efficiency, better airflow and reduced energy and maintenance costs. 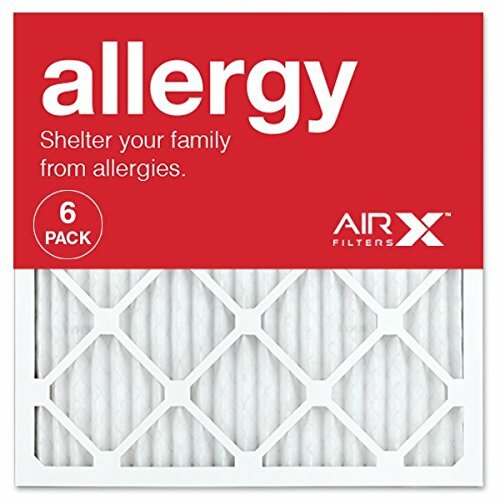 AiRx Allergy 20x20x1 Air Filters outperform fiberglass, washable, reusable one-inch filters and typical pleated filters by using more pleats per square inch and high efficiency filter media. More pleats means better airflow and reduced energy costs as well as better dust holding capabilities. Buy with confidence and expect these filters to last 90 days in most homes or for increased energy efficiency, replace filters every 2 months. Compare these filters with 3M Filtrate brand filters with MPR800 - MPR1200 ratings, including Micro Particle, Allergen Reduction and Allergen Defense models. MERV 11 furnace filter premium pleated filter, actual size 19.5" x 19.5" x .75"